After getting a great chance to shoot the solar eclipse a couple years ago, I’ve been itching to point the cameras back up in the sky. I did a good bit of research into the shoot and thought I was pretty well prepared, I had the Canon 5DS with the 500mm and 2X teleconverter on one tripod with the jobu jr. gimbal head and a wireless shutter release. On a second tripod (that has a simple manfrotto video head) I put the Sony A7RII with the 100-400GM and 1.4X teleconverter. Salwa was using the Canon 5D III with the 100-400 L II and 1.4X teleconverter on her travel tripod. As the Moon came over the little mountain ridge behind our house we took a few practice shots to get our settings right. I had watched where the moon was traveling the night before and thought I had a pretty good idea of where and how to get the sequences. Interestingly, this was where we had significant issues getting the shots…especially since the weather hit us with the coldest temperatures of the year so far. The eclipse was going to be 4 or so hours of shooting so that we could get everything from the full moon, through partial to the full red moon and back again. Partial eclipse moving quickly towards full lunar eclipse. didn’t realize how vertical the angle of shooting would be and that some of the setups were going to be problematic. Video head couldn’t go vertical enough and I couldn’t use it during the full eclipse but it was the easiest one to keep centered on the moon since the handle made for easy small movements and the Sony camera was easy to use with the tilting screen. The jobu gimbal definitely had better range of motion but with the wind was a major negative factor with the 1000mm. 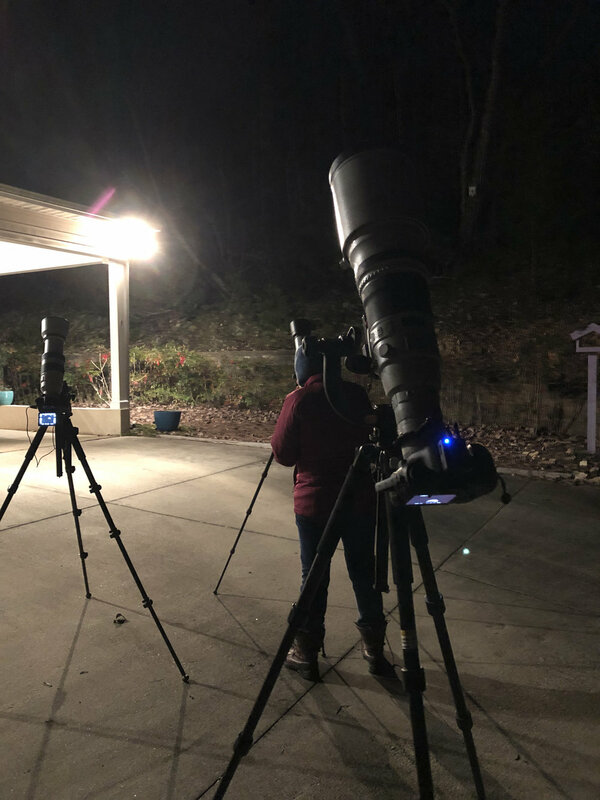 The Canon 5DS is a great camera but the lack of a tilty-flippy screen made things really difficult in combination with trying to shoot nearly vertical on a freezing cold night. I do have a black magic monitor and I think that I will have that ready for a shoot like this next time although I would need external power supply for a 4 hour shoot. I have also learned that I will likely need some sort of windscreen for that big lens as well as some weights on the tripod. cameras pointing nearly vertical during the eclipse. That flippy screen on the Sony made things so much easier than trying to look at the Canon….too bad the tripod head that I used on the Sony wouldn’t go much more vertical than what you see here. I also think that the 2X teleconverter was probably the wrong choice as it does reduce image quality and with the length every little movement is exaggerated. I actually replaced the 5DS for the last half of the shoot with my Canon m50 (and removed the 2x teleconverter). I’ve been considering a Goto astrophotography mount for the last few months (along with an actual telescope) and am now ready to put money down on one as longer exposure shots of stars, planets and things like these eclipses you can stop worrying about keeping your subject in the frame and think more about getting the shots you want. Looking seriously at the sky-watcher Skymax 102 AZ-GTi 102mm f/13 GoTo Maksutov-Cassegrain Telescope. Full eclipse, subtle red colours and nice shadows….would have liked a bit more detail in the shot but this was as good as it got. With all those issues we were still reasonably happy with the shots we got. As it turned out, the atmosphere was not the best for shooting even though it looked clear so we were not going to get amazing detail but I think I captured the moments and the sequence in a way that I’m happy to look back at the shots. Of course, now comes the hard part. I have a few shots that stand alone but I think that I need to produce a composite that shows the entire sequence in a way that looks interesting but also isn’t necessarily just going to be like all the others I’m expecting to see on the net in the next day or two. Stay tuned…. near the end of the full eclipse, light is starting to come strong on the upper left of the moon.